New York, NY – April 26, 2017. Ron Gordon Watch Repair, a top-rated watch repair service for NY, New York, and a specialist in Tag Heuer repair and service, is proud to announce a new blog post on the reissue by Tag Heuer of the Autavia. The reissued Autavia is the result of an intense and popular social media campaign by Tag Heuer that resulted in 50,000 votes being cast. As one of the top watch repair shops in New York City, Ron Gordon Watch Repair uses its blog to share a passion for watches and a focus on history and style in the watch industry. To read the new blog post visit https://www.rongordonwatches.com/2017/04/tag-heuer/. To learn more about Tag Heuer watch repair, visit the website. Among luxury watch brands, Tag Heuer has a reputation for both style and substance. Many people are drawn first to the brand for its sportsmanlike look, and then become even more intrigued when they learn about the brand’s technological prowess. In addition to both style and substance, Tag Heuer has a long, storied history in the watch industry. 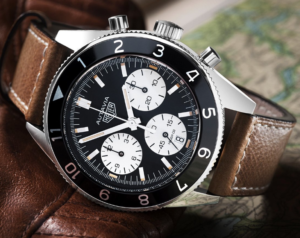 The newly reissued Autavia builds upon Tag Heuer’s uncanny ability to wed both old and new, bringing an “old” watch back to the market by using “new” techniques such as social media. By highlighting this trend on its lively blog, Ron Gordon Watch Repair is helping cultivate a passion for watches and watch history among a new generation of New Yorkers. Anyone with a Tag Heuer in need of service or repair is urged to reach out to Ron Gordon Watch Repair for an inspection and a repair estimate. It would be a great tragedy for such a watch to sit idle in a drawer, when with a little repair it can be brought back to tip top condition by one of New York City’s premier watch repair shops. Next Post: Swiss and Luxury Watches: Who Owns Which Brands?